The image shows the hive with the optional bolt on legs. The hive is 39 x 17 x 12 inches deep supplied assembled and empty (contents are available as an option). 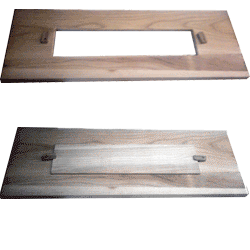 All woodwork is knot free untreated 19mm solid timber. Hive box incorporating smooth moulded entrances at both ends. Varroa mesh floor and inspection tray. Vented, galvanised metal clad gabled roof. 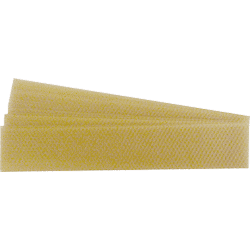 The hive can be supplied with contents: 26 of our especially designed Top Bars and 1 Dummy Board (wax starter strips or comb guides are available but not included). Bolt on legs including bolts and nuts can be added. An observation window with removable wooden shutter can be added. 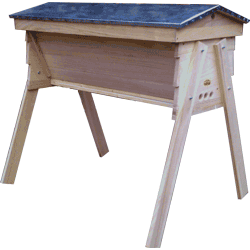 This horizontal top bar hive is our own design, a result of experimentation and experience. 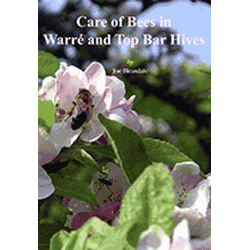 With current beekeeping practices in mind as well as the needs of the bees, it has unique features not found in generic top bar bee hives.